I wrote this for my church’s e-news. Thought I’d include it here. During our Tuesday staff meeting, Mark and I were talking about Jesus’ family, and how he experienced not only the blessing of having a father, mother, and siblings, but how he also may have experienced the “blessing” of family loss and sorrow. He encouraged me to write out my thoughts. relatively early in the story of Jesus’ life. 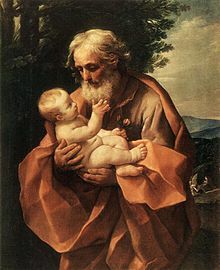 In fact, the last mention of Joseph in the gospels comes in Luke chapter 2, when Jesus is about 12 years old. After that, there’s no mention of Joseph at all in Jesus’ adult ministry. Tradition has held that Joseph died, leaving his wife and children alone.Even understanding that “adulthood” began a lot earlier than it does for us today, that’s pretty huge. Jesus grew up without an earthy father. Jesus also had a family, and Mark’s gospel actually lists Jesus’ brothers and sisters (in a way): James, Joseph, Judas, Simon, and sisters (plural, though they remained nameless). Including Jesus, that makes at least seven children. All without a father to provide and care for them. What’s more, we are also told in Scripture that those brothers and sisters didn’t think too much of their preaching brother. Mark notes that his family thought he was “out of his mind” (3:21), and John indicates that even at the cross, Jesus had to hand his mother over to the care of the apostle John (John 19:25-27), implying that his brothers and sisters were nowhere to be found. They wanted no part of Jesus’ life, much less his death. (In their defense, Jesus’ brothers eventually came around to recognized him as Messiah; his brother James was the leader of the Jerusalem church and eventually wrote the book of James). What I’m trying to say—and what part of the “Good News” is—is that not only does Jesus come to us in the midst of our family wholeness, he comes to us in our family brokenness. He knows our sorrows, as well as our joys. This entry was posted in faith and tagged brokenness, family, incarnation, Jesus. Bookmark the permalink.